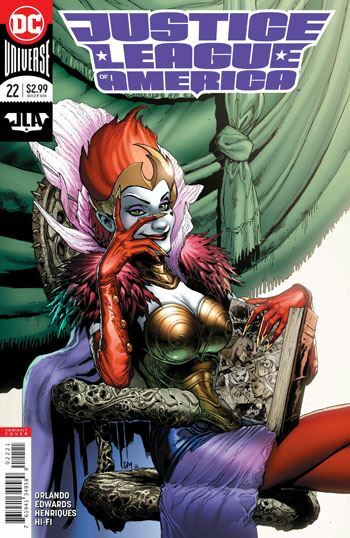 I do love the Queen of Fables. Her introductory story, many years ago in JLA, was really fun, and I am pretty sure that Steve Orlando enjoyed it as well, from the way he makes use of her in the latest issue of Justice League of America. The build up to this storyline has been slow but deliberate, and all wound up hinging on Killer Frost and her relationship with the Atom. A fully understandable decision, a choice one cannot condemn, winds up bringing disaster to the team, and to the world. The Queen of Fables turns out to be the Might Behind the Mirror, and the wishes she has been granting have all functioned to make it possible for her to enter the real world, which she finally does. Neil Edwards and Daniel Henriques do a superb job on the art for this story. The villain looks just great in every panel. 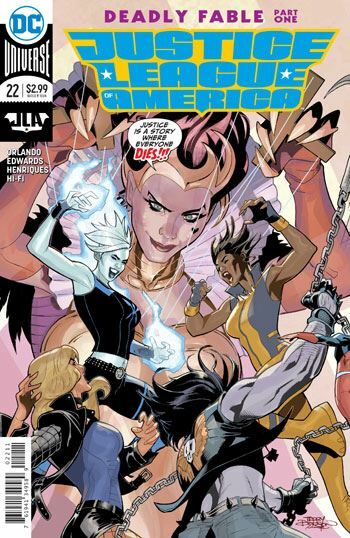 The last issue, which gave the focus to the Ray, while introducing the new Aztek, proves to have had repercussions that factor into this story. Now that we are further into the run, it is clear to see how Orlando has been weaving his webs, laying in plot threads whose purpose only becomes clear later on. That’s the kind of storytelling that can take a while to pay off, but comes with so much more satisfaction when it does.